Manufacturer of a wide range of products which include gasend pill. Gasend Pill is herbal pill advised in Gas trouble, indigestion, flatulence, distension, abdominal colic. Relieves gas within a short time, reduces bloating of stomach and regularizes digestion. The safe herbal remedy for Gas trouble and indigestion. 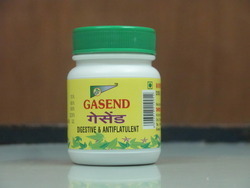 Indications: Most of the ingredients incorporated in Gasend are well-known appetizers and digestive agents, which are described in Ayurvedic treatises. Indicated in indigestion, flatulence, distension, gas trouble, abdominal colic.